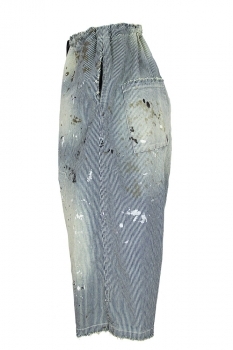 Magnolia Pearl one-size, Railroad striped cotton, Frankie Denim with hand ageing, distressing and mending. Pull-in grey drawstring waist, with button fly and covering placket. 2 side pockets. 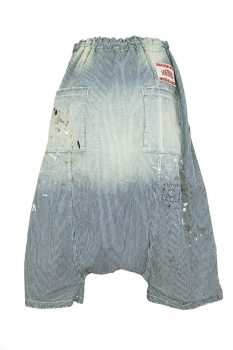 Cut-off style and very low crotch. 2 patch pockets at the rear and 'Sanforized' embroidered label above right rear pocket. The waist is very wide and Magnolia Pearl have perfected the shape so the waist pulls in wonderfully.